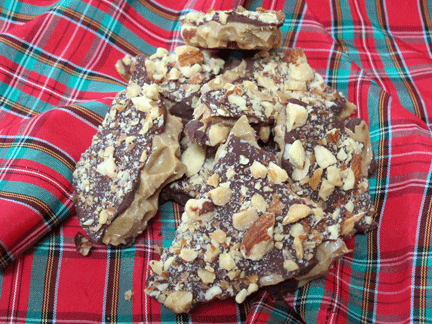 I began making this toffee around the holidays in the early 1980’s. When I flew home to visit my folks in Pennsylvania, I introduced them to my toffee and they loved it. My mother was an apt pupil, soon turning out batches for friends and family back East. 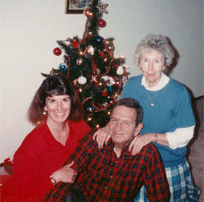 When my parents moved to San Diego in 1988, we all looked forward to our first “California Christmas” together. I remember the three of us making toffee in their new kitchen and my mother saying, “I feel like we are a family again!” As it turned out, there would only be three such Christmases. We lost my Dad to cancer in 1991 and memories of that first holiday without him are filled with sadness. Here we are, though, enjoying Christmas Eve of our first California Christmas. When my mother died three years ago, I thought I would put my toffee recipe away for good. Grief changes over time and this year I’m cooking my way through my toffee gift-list. In honor of Mama’s Scottish roots in the MacPherson family, I renamed my toffee. 1. Put half the nuts and half the chocolate chips onto a cookie sheet. 2. Cook butter and brown sugar over medium-high heat in medium-sized pot, using a candy thermometer, to “hard crack” stage, 300 degrees F. Stir constantly. This will take about 15 minutes. Using a copper pot allows you to cook at a higher temperature without burning the caramel. 3. Remove pot from heat and quickly add salt and vanilla. 4. Carefully pour caramel mixture over the mix of nuts and chocolate. Sprinkle remaining chocolate over hot mixture. When melted, smooth out with back of large spoon. 5. Sprinkle remaining nuts and gently press into the toffee. If you like salted caramels, you may want to sprinkle some good quality sea salt on top of the candy. 6. Freeze one hour before breaking into pieces for storage – or snacking! Look at all the families you have now added these lovely memories to with your toffee and how it will continue to their children because you have shared today. My family is included in this. Blessings! You are so kind – thanks and Merry Christmas to you and your family! I am sooo glad you posted this recipe! My mother made a version of this and it was always my favorite. (I think hers was named after a different country). This sounds soooo good. I will definitely be including the sea salt. Yes, the sea salt was an added touch this year – thanks, Lynda! I ate some last night while watching Home Alone, what a treat. Good gracious, that looks wonderful– exactly what toffee should look like. I’m going to have to give this one a go. Thank you for sharing the recipe! I hope you enjoy it – I have totally given up baking cookies, as folks go nuts for this! This looks so good! Love your family picture too! This toffee looks perfect. I have been making a few different toffee recipes to give as teacher gifts over the last few yrs…think I’ll go with your’s this year! I hope you are pleased with the results – some folks like it with the sea salt and others don’t. Thanks, Winnie! Hi liz! Your sentiments are truly lovely with regards to your family and the reasons why you started blogging…mine are much the same…I shall be following your blog! How kind of you – I look forward to following your blog too. Mine is only 3 months old but has given me a lot of satisfaction, recalling family memories, especially in the kitchen. Thanks again! Boy, do you ever have good taste!!! YUM! 🙂 I think you already know that I have a weakness for toffee like this . . .
Just got back from Atlanta last night and am catching up this morning. I’m going to HAVE to make this!! I’ll have to omit the almonds unfortunately – any suggestions for a nut-free substitution? I have missed you on line – happy holidays and skip the nuts! I think family recipes are the best, and I applaud you for pulling this out again after your mom’s passing. P.S. Now I have another reason to go buy myself a copper pot! Mmmm….. Once again, your toffee is the best! Thanks for sharing the recipe — next year I may request a hands on lesson!